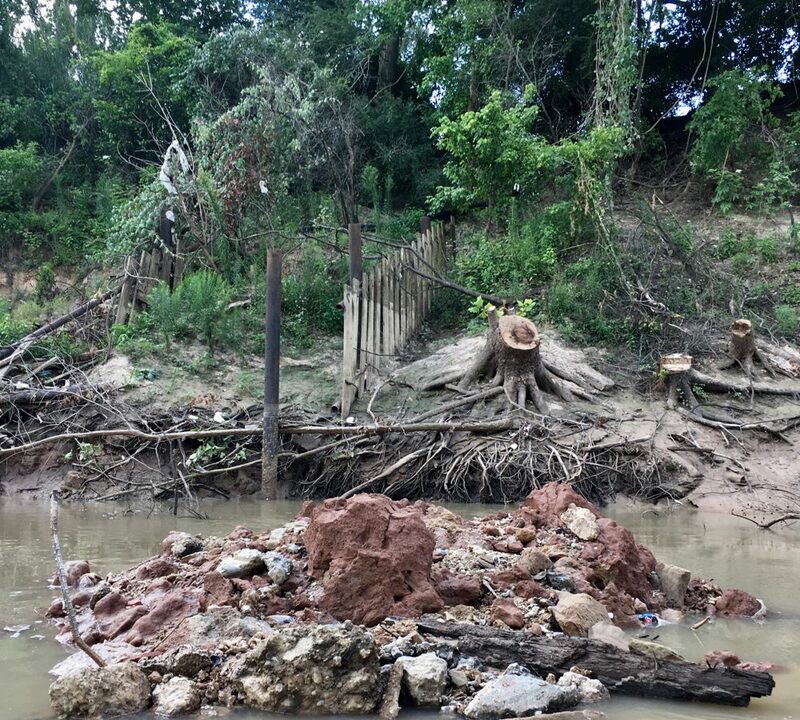 For months we have been receiving complaints about the damage the Harris County Flood Control District is doing to Buffalo Bayou. 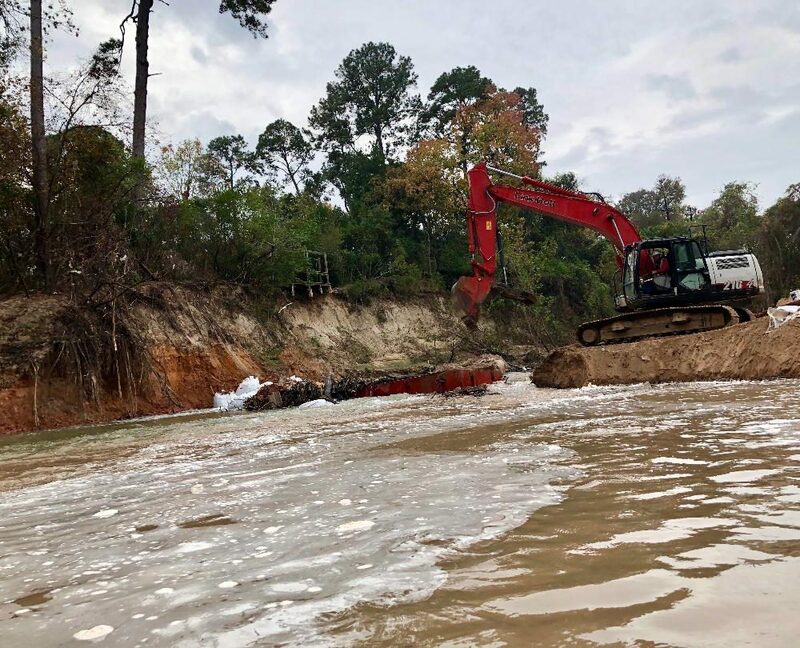 Citizens have been sending us video and photographs of contract workers dredging, banging, mucking, bulldozing, slamming and damming the channel and banks; dragging, cutting, and removing large trees, live trees, trees fallen against the banks, trees fallen in the woods. And now we have reports that they’ve done the same to Cypress Creek in northern Harris County. 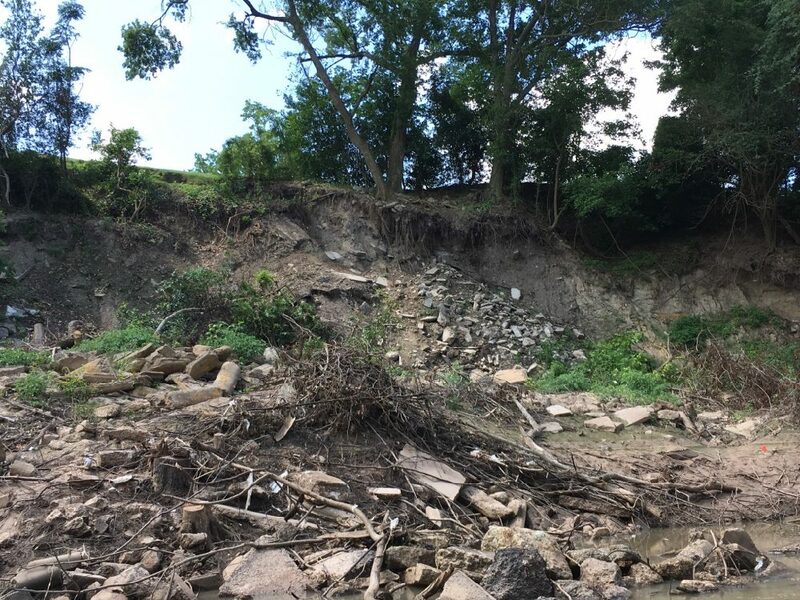 The “maintenance” they have done – virtually clearing out the channel and banks — will lead to greater erosion and instability, more sediment and more flooding. And more costly maintenance. Harvey and the flooding that followed left a huge amount of woody and other sorts of debris in our bayous, our natural drainage system. 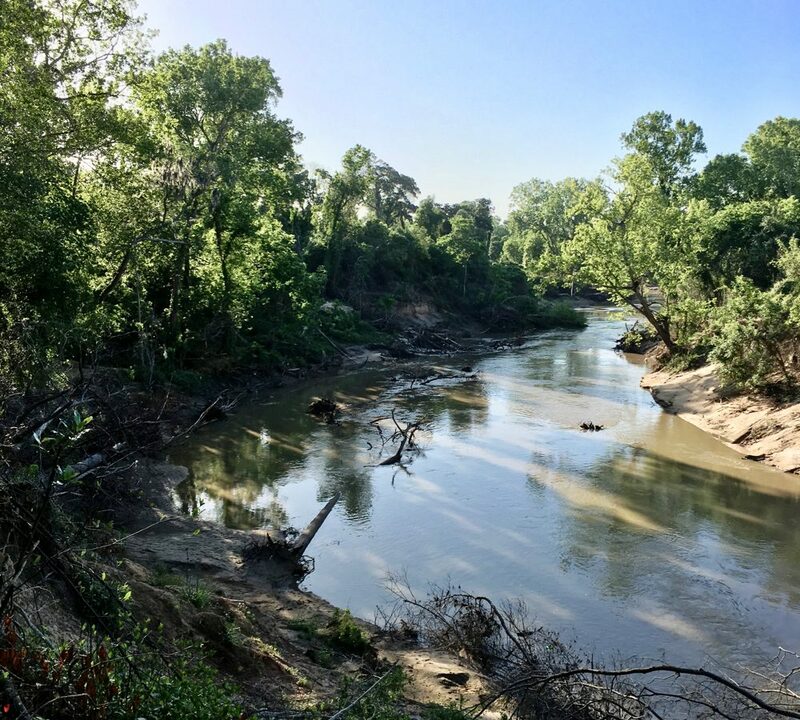 Buffalo Bayou, our main river, flows from its source in the Katy Prairie for some 53 miles east through the center of Houston, becoming the Houston Ship Channel and emptying into Galveston Bay. For much of that route, the 18,000-year-old bayou remains one of the few relatively natural streams in the city. It accumulated a lot of debris, logjams and snags during Harvey, as did Cypress Creek. 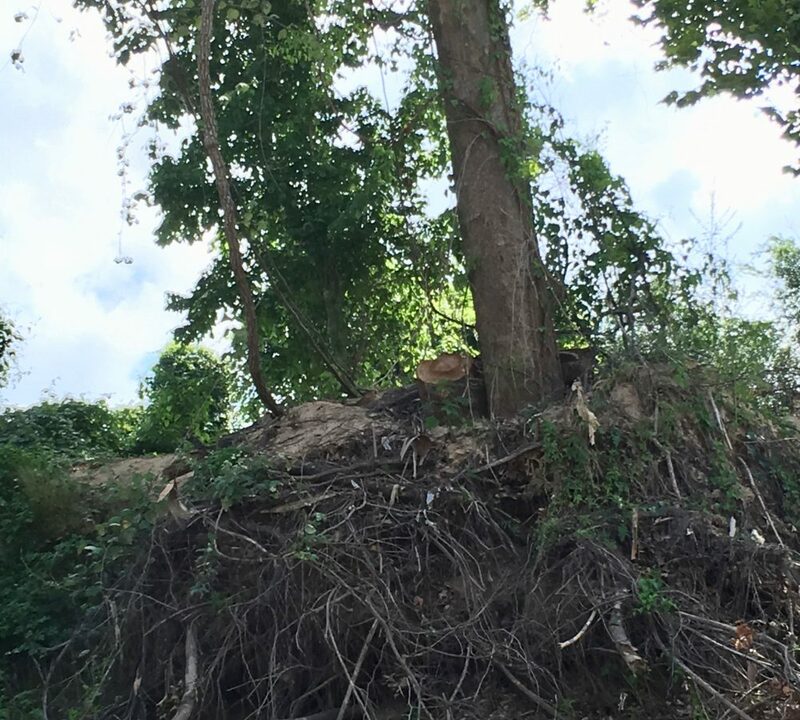 There are trees along Buffalo Bayou, great tall trees in places, and they sometimes fall into it. Trees have been doing this on rivers for over a hundred million years. Trees, before and after they fall, are a crucial part of the river’s natural system. Overhanging trees shade the water, regulating the temperature. Their extensive roots, together with the roots of riparian plants, anchor the bank, protecting the bank from washing out. When trees fall into the channel, they continue to provide stability to the stream and its banks, trapping sediment, fortifying against and deflecting heavy flows, helping the channel to maintain a healthy width and depth and to form riffles and pools, helping the stream to restore itself more quickly after a flood, and providing food and habitat for the diversity of creatures large and small that sustain the bayou’s ecosystem. Both Buffalo Bayou and Cypress Creek experienced severe flooding as a result of Harvey, for a variety of reasons, though Cypress Creek floods more regularly. Removal or repositioning of some large woody debris that blocks the flow is necessary for what flood managers call “conveyance” as well as recreational paddling. But there are right ways and wrong ways of doing it. 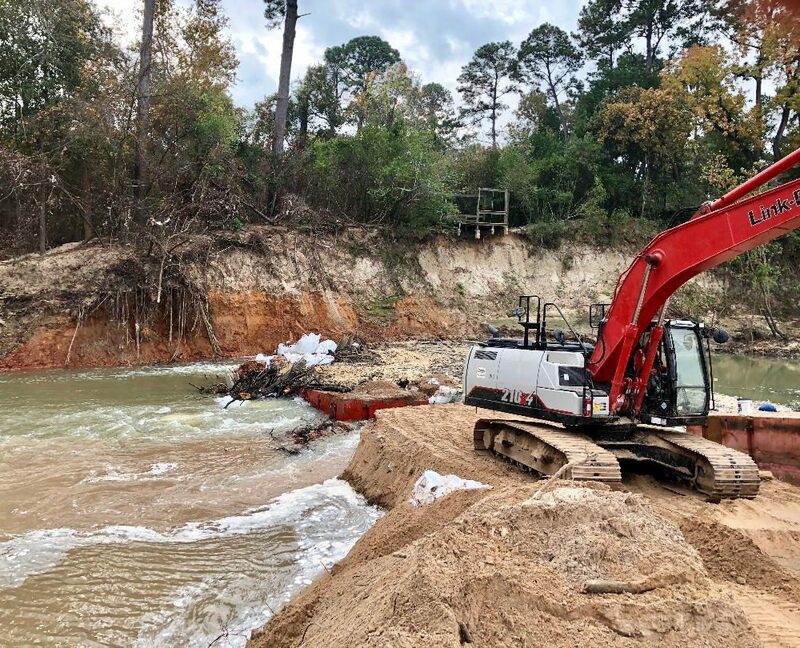 By contrast, the Harris County Flood Control District continues to remove most of the large woody debris in the channel and even cuts down living trees. Its debris removal contractors are paid by the ton, which can lead to inappropriate, opportunistic clearing. There seems to be little oversight. One witness reported seeing a large fallen tree being dragged down from the high bank in Memorial Park. 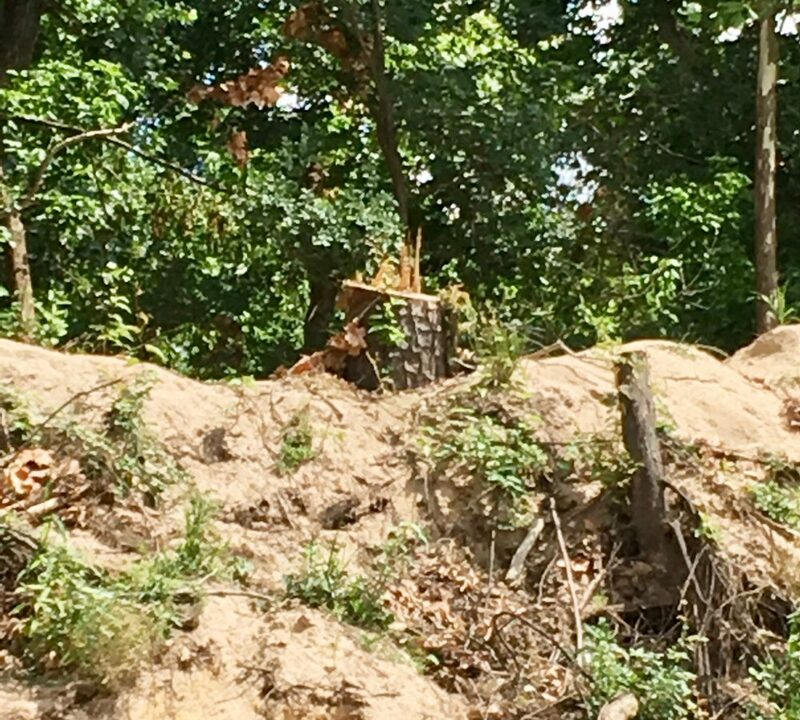 On a recent canoe trip past the park, we saw the stumps of numerous large trees high on the bank that had been recently cut. Gravel bars covered with mussel shells in the channel had been dredged and banks scraped and cleared, wetland springs mucked over. The concrete remnant of the historic Camp Logan bridge linking the north and south banks had been removed from the middle of the stream. Another view of the dam on Buffalo Bayou constructed by maintenance contractors to raise the level of the water for floating debris barges. The same bend in the river on April 15, 2018, before removal of wood from channel and banks. Now they were removing the logs where they had planned to spend millions to put them in. In order to do this maintenance, the contractor bulldozes a path and sends heavy equipment, a trackhoe, down the bank and onto a floating barge. The district has only a few access points on Buffalo Bayou, chiefly property off of Willowend Drive in Memorial west of Voss Road and a temporary easement on Asbury Place west of Shepherd Drive, as well as Terry Hershey Park, which the district owns, between Highway 6 and Beltway 8. Watch this video of a maintenance trackhoe dragging the north bank of Buffalo Bayou upstream of Shepherd. 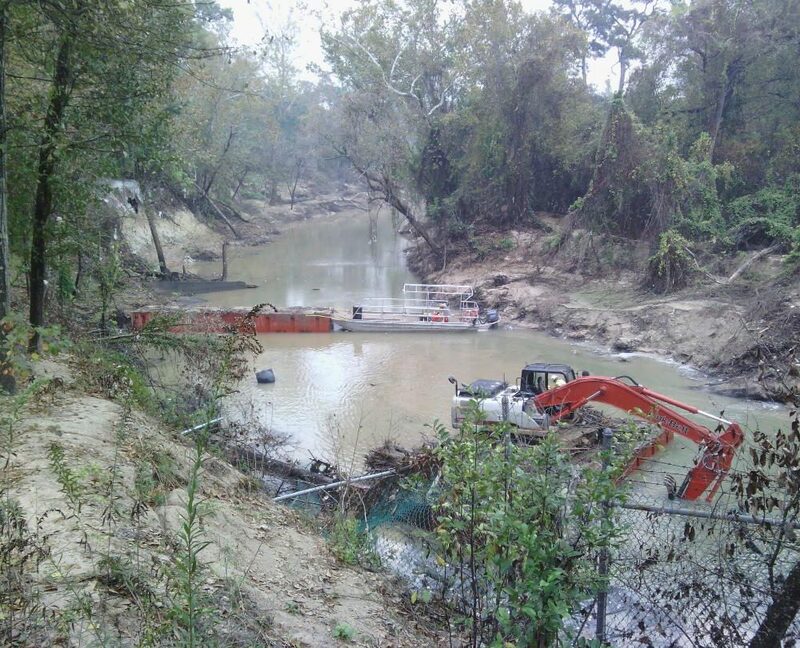 In order to facilitate the floating barge in the low flow of the bayou, which can be less than a foot in places, the contractor builds a dam to block the flow and scrapes and dredges the bayou bottom to deepen the channel. Nevertheless, the barge sometimes gets stuck in the sandy, sandstone channel, and on one occasion recently sank. 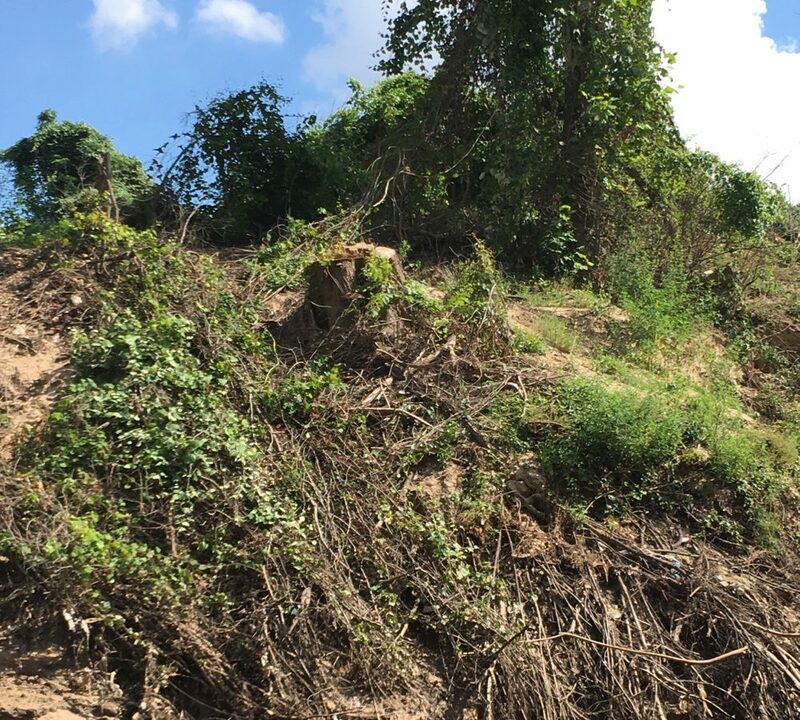 Watch this video of the debris removal contractor at work on Buffalo Bayou in Memorial Park on May 19, 2018. 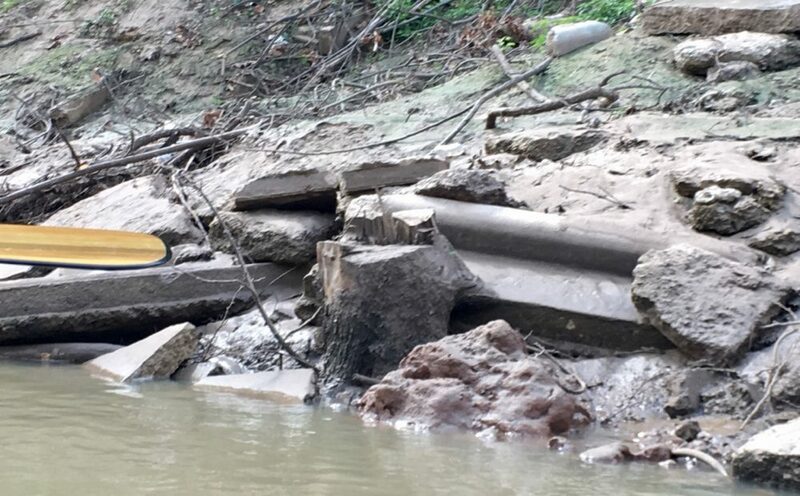 Since removal of the large woody debris results in greater amounts of sediment flowing downstream, more of this sediment ends up in the Houston Ship Channel (and in parks and property along the way). The Port of Houston spends an average of $30 million a year to dredge sediment out of the 52-mile long ship channel and maintain the ship channel at its authorized depth of 45 feet, said Port representative Bill Hensel in a recent telephone interview. 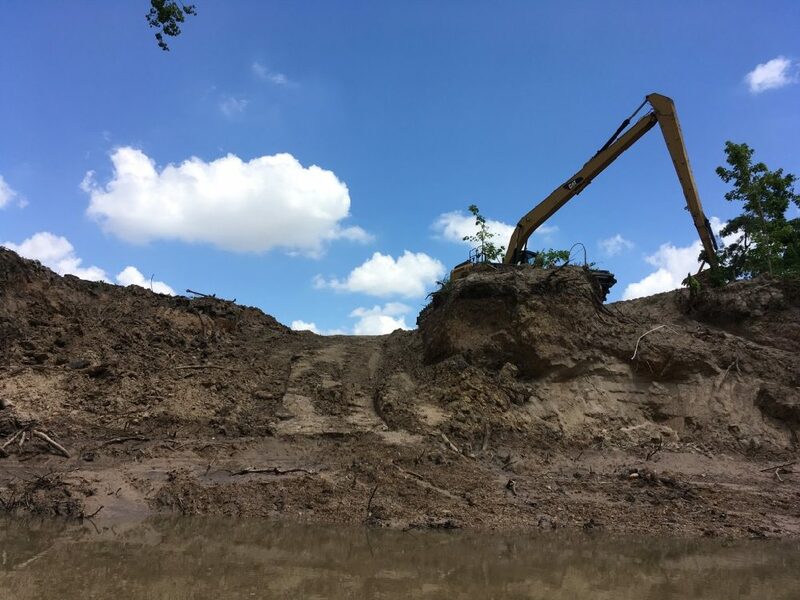 Sediment capture and control is an issue for the Port, which owns the submerged lands of Buffalo Bayou, despite what the county appraisal district tells adjacent property owners. (Maps show ownership to the center line of the bayou.) At a winter conference in Galveston organized by the Galveston District of the Corps of Engineers, the Port’s Chief Infrastructure Officer Richard Byrnes called for enhanced flood management projects to better capture sediment. 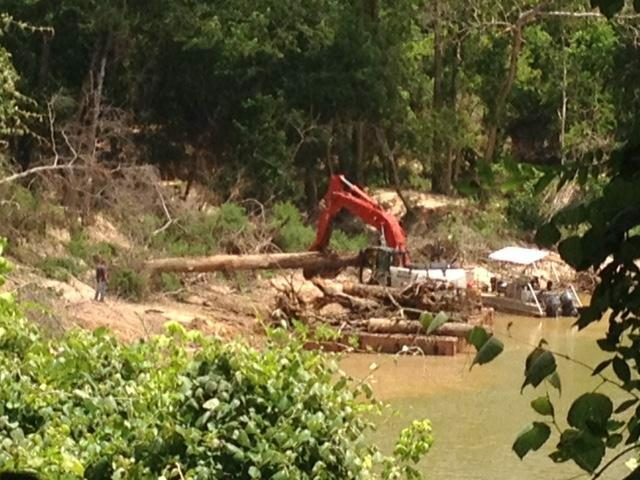 What should Flood Control be doing about the large woody debris in the bayou and elsewhere? 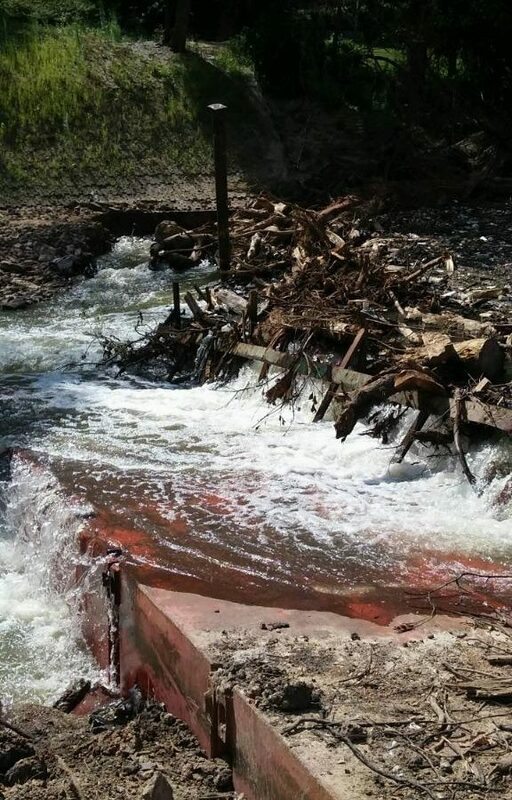 Public agencies across the country from Connecticut to the Mid-West (and here), from Fort Worth to the West Coast recommend leaving fallen trees strategically placed in the stream and against and on the bank. Public officials first survey a stream, noting where there are problems blocking the flow. The consensus is that fallen trees in the channel should be left parallel or at a 45-degree angle to the bank, facing downstream with the root ball upstream. If necessary, the logs can be anchored to the bank. Those who know the bayou well report that some large logs with root wads had been in place for several decades and more. Having received notice from the district about debris removal activities on the bayou following Harvey, we first raised our concerns and asked Matt Zeve, chief of operations for Flood Control, to clarify the district’s policies and practices last November. However, we saw the contractor mucking around in the channel bottom. The banks were virtually cleared in most places. Workers are authorized to cut live trees leaning over the water at a 45-degree angle, though they are supposed to consult with Flood Control first, said Karen Hastings, project communications manager for the district. Cutting down trees providing cooling shade to the stream is bad enough. But we documented the stumps of numerous upright trees that had been cut on public and private property. Stump of an upright tree recently cut, apparently by maintenance contractors, on the north bank of Buffalo Bayou in Memorial Park. 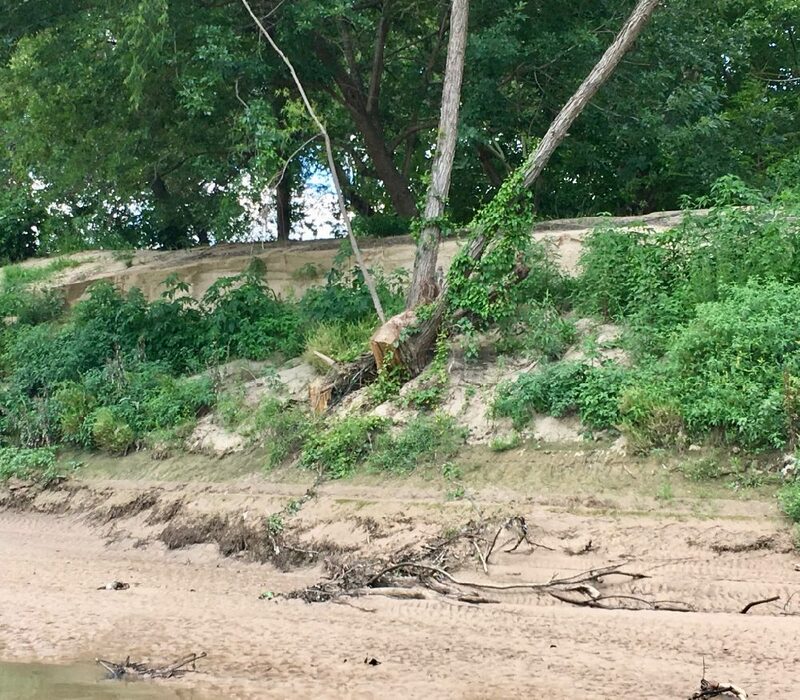 Another apparently upright tree cut on the south bank of Buffalo Bayou. A group of trees recently cut on the south bank of Buffalo Bayou across from Memorial Park. Pile of material dredged from the channel dumped in the foreground. Another tree cut on the south bank of Buffalo Bayou owned by the River Oaks Country Club, which apparently dumped concrete debris onto the bank in an effort to protect against erosion. 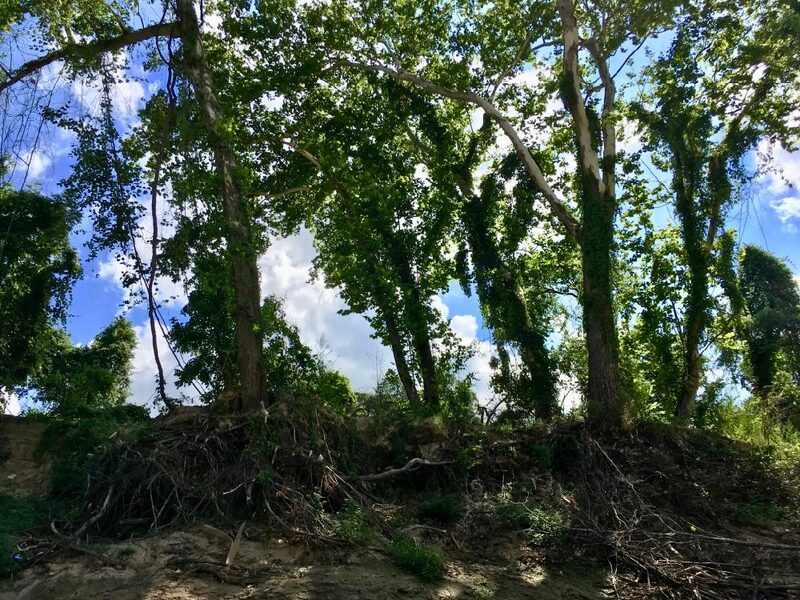 Trees and their roots, including fallen trees, protect banks against erosion. Stump of a sycamore, barely visible on left, recently cut among a group of sycamores on the bayou bank in Memorial Park. Close up of the sycamore cut down on the bank in Memorial Park. 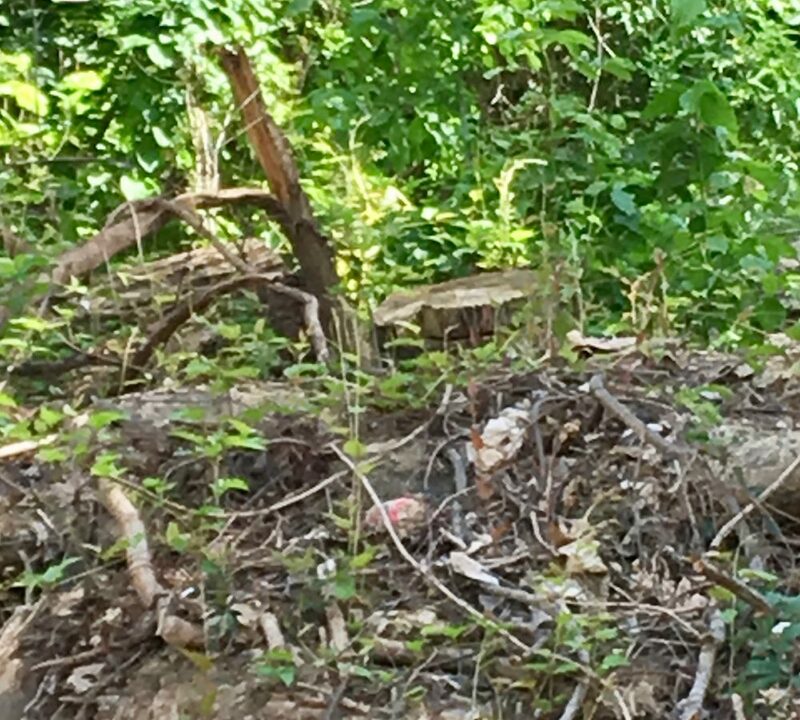 More stumps of trees cut down on the south bank of Buffalo Bayou. These trees, surrounded by concrete debris apparently dumped on the bank for protection against erosion, would have helped protect against erosion. 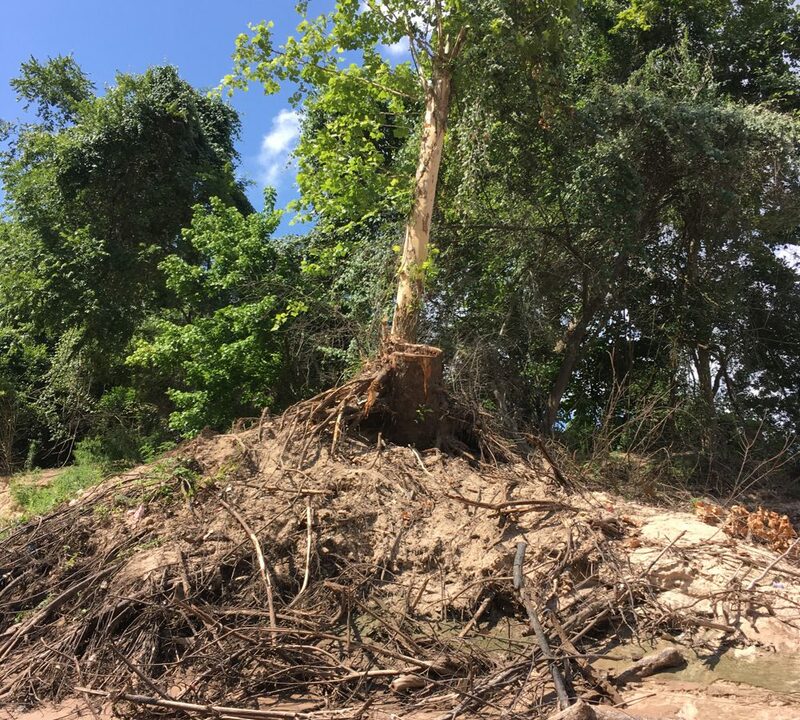 Upright tree on north bank of Buffalo Bayou in Memorial Park recently cut by maintenance contractor for Harris County Flood Control District. 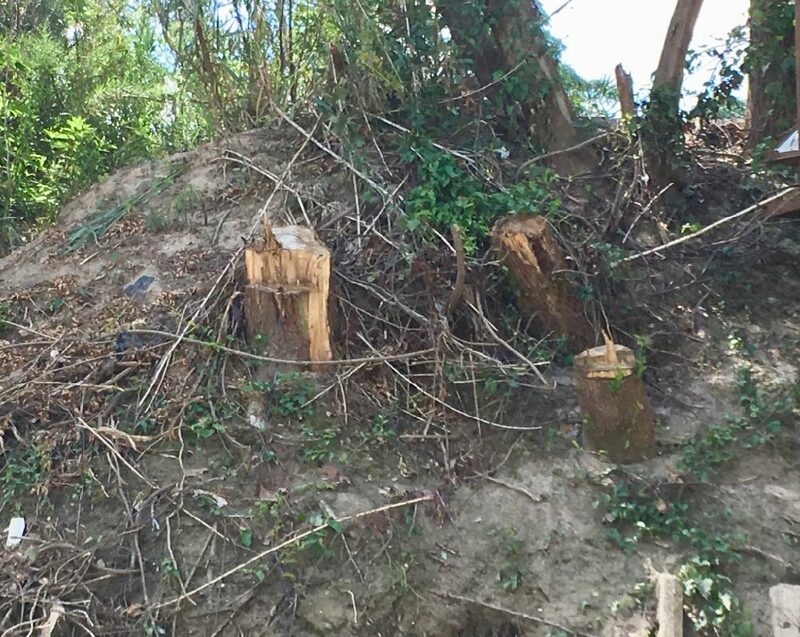 More upright trees chopped by maintenance contractors on the south bank of Buffalo Bayou. Another tree cut on the bank of Buffalo Bayou. Flood Control does not have the right to access private property without the owner’s permission. 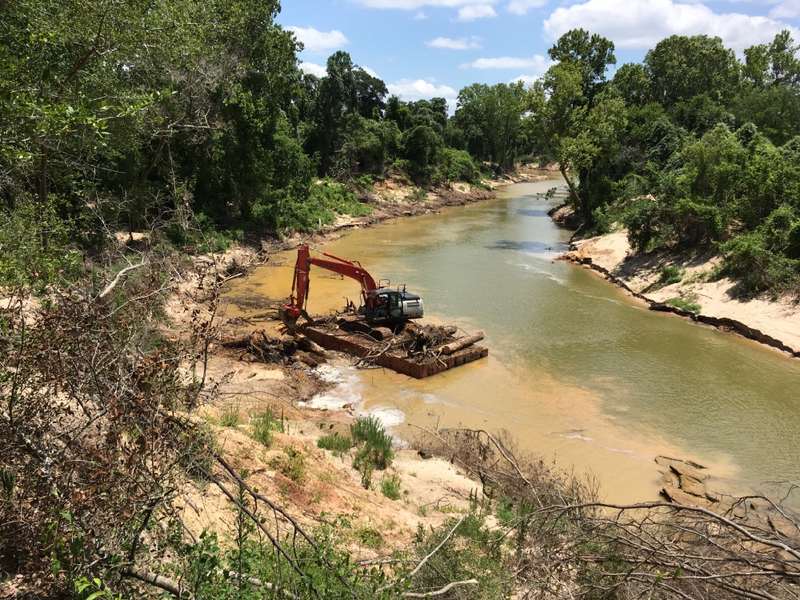 Debris removal operations were continuing up Buffalo Bayou to Voss Road last week, as well as on Cypress Creek, said Hastings. Large woody debris removed from the streams is taken by the contractor to a “debris management site.” Some if not all of it is turned into wood chips. “This is a debris removal contractor, tasked with removing obstructions to stormwater flow,” said Hastings.